Looking for a way to mark your next birthday or Anniversary? Give Kitchener Limo Rentals a call. We are here to serve the Kitchener, Waterloo, and Cambridge areas in creating unbelievable and exciting occasions for our customers. With our large selection of facilities and our amazing staff, we can help you create an evening to remember. Give us a call today to book your next birthday or anniversary. Our staff is standing by, waiting to create the perfect evening for you. 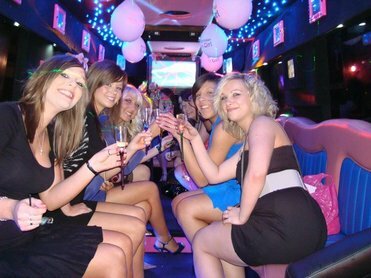 Celebrate your sweet 16, your 40th birthday, or any anniversary in one of our fabulous party buses. You’ll be amazed at the sophisticated technology and luxury found in each of our limos and party buses. Equipped with state of the art sound systems, TV’s, lighting, and even smoke machines, you’re sure to be impressed and satisfied. Enjoy our different food/beverage bar options, and even VIP services. Go ahead and treat yourself with one or our exceptional transportation vehicles. Nothing is better than spending time with friends and family, making incredible memories. 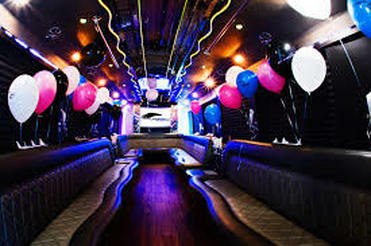 Our party buses can hold up to 56 passengers. They’re perfect for any teen’s monstrous guest list and you’ll rest easy knowing they’re safely escorted to different party venues. Our team can also help in arranging and contacting different vendors and event planning services for further ease and stress-free party planning. We pride ourselves in making our customers satisfied with our services. 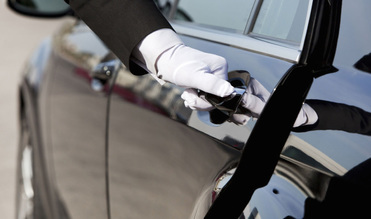 Unlike other limo services, we go the extra mile and take personal care of our clients. We also have other limos, SUV’s, and high quality luxury cars for more intimate affairs. Our drivers can help recommend top places to dine in the city, and other sophisticated events to take you to. Our drivers also provide the most direct route to places to you arrive promptly and stick to your evening itinerary for continued convenience and pleasure. Relax, and share special moments of your anniversary, staring into your loved ones eyes. No driving, just spending extra time together, enjoying our transportation services in one of our exquisite facilities. You may never want to leave one of our amazing vehicles. Our drivers are professional and sensitive to intimate affairs, and will make sure your evening is perfect. Make unforgettable memories using our limo rental services. We pride ourselves in being Ontario’s premier limo services. Looking for a way to mark your next birthday or Anniversary? Give Kitchener Limo Rentals a call. We are here to serve the Kitchener, Waterloo, and Cambridge areas in creating unbelievable and exciting occasions for our customers. With our large selection of facilities and our amazing staff, we can help you create an evening to remember. Give us a call today at 226-241-9927 or fill out the information form on your screen to book your next birthday or anniversary. Our staff is standing by, waiting to create the perfect evening for you. Give Kitchener Bachelorette Limo Rentals your trust and we'll take care of all your transportation needs.